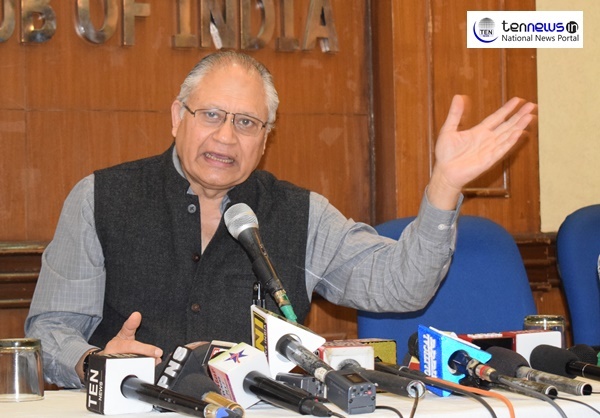 New Delhi :(08/02/2019) Shiv Khera in a press conference held at Press Club Delhi addressed media on the issue of NOTA (None Of The Above) as the General Elections are on head. The press conference was called to address the current toothless and useless concept of NOTA which does not make any difference, even if NOTA gets the highest vote it’s meaningless. At present there is no rule about the fate of the election if NOTA gets majority of votes making a mockery of Democracy. He stated that he was one of the petitioners in People’s Union of Civil Liberties v/s Union of India where the Apex Court in its decision directed the Election Commission of India to provide NOTA in ballot papers/EVMs. The average voting of this country is around 50% and we have three kind of votes. First is the Vote of Trust when the voter say that he wants to choose a candidate. Second is the vote where one has no choice and the third is the voter who doesn’t want any of the candidates to win as the voter finds all the candidates undesirable. Shiv Khera further stated that we are the largest democracy in the world no doubt but the question is, Are we a good democracy? The dilemma that the citizens are facing today is that they have to make a choice between all undesirable candidates resulting in choosing the least undesirable one. Undesirability includes criminal mafia or choose not to vote and protest in a passive manner. Now if the citizens go to vote and even choose NOTA, by default the candidate who wins with a handful of votes is still undesirable. Dr. Harsh Pathak who is the main face behind the begining of this awareness campaign, proposed a way of Active Protest that if NOTA gets the highest votes, that means NOTA wins. And it further means that the constituency has rejected all those other candidates hence all candidates (seeking election) from that one constituency should be disqualified only for that one and one upcoming election only and a fresh election should take place in that constituency. By doing this, it will force all the political parties to field good candidates to avoid the wrath of the citizens. This also empowers citizens to come forward and good candidates will get involved into active politics rather than remain passive. The financial cost of such re-election would be a lot less than the damage being done by the corrupt undesirable candidate sitting in Power for five years.